Eastbourne Borough substitute Lloyd Dawes inflicted late heartbreak on a ten-man Horsham with an injury-time winner in the Sussex Senior Cup on Tuesday. The Hornets more than held their own for 92 minutes of this third round tie at Culver Road against National League South opposition. That made the late winner even more gut wrenching, especially as the hosts had played the final 25 minutes with ten men, having had Dorking Wanderers loanee Kieran Lavery sent off for a tackle on ex-Crawley Town man Sergio Torres. On whether it was a case of what could have been or a feeling of pride, Horsham manager Dominic Di Paola said: “It’s a mix of both. I would have been interested to see how it went if we had kept 11 men on the pitch as it was a relatively even game. “We were the better side in the first half and they were dominant in the second half even before we went down to ten men, if I am honest. “I said to Wezzo (Adam Westwood) at half-time, I cannot ask for much more from them, we played some lovely stuff and should have been a couple of goals ahead. “It’s a cliche, but the more you go up a couple of levels against teams that are better and sharper, that’s when you have to take them. With kick-off delayed for 15 minutes due to traffic problems, it forced Horsham into a reshuffle as Will Hoare still didn’t arrive in time, so Lewis Hyde came in for a rare start. There were constant chances at each end as Charlie Walker headed at Josh Pelling.Lavery got end of a move he started, but had his effort blocked, Harvey Sparks fired at Mark Smith and Lee Harding blazed over the bar. Pelling kept out a long-ranger from Andrew Briggs, before on the half-hour mark Charlie Harris, against his former side, had an effort dangerously parried away. Harry Ransom somehow headed over a David Martin free kick from close range, while in stoppage time, Rob O’Toole showed a heavy touch when one on one to be denied. Borough substitute Kristian Campbell was straight into the action, crossing for Reading loanee Adam Liddle, whose glancing header was saved. Campbell then put in a last-ditch tackle to deny Harding at the other end. Liddle should have done better with a lob into Pelling, before Lavery was shown a straight red card after catching Torres on the shin having overrun the ball. Chances continued at either end with Borough’s other Reading loan man Joel Rollinson chipping over the bar. Liddle headed against the woodwork and Campbell’s follow-up was blocked. Horsham did have the ball in the net soon after as sub Tyrell Richardson-Brown’s ball found Hoard and was put in by Sparks, but the previous touch was offside. 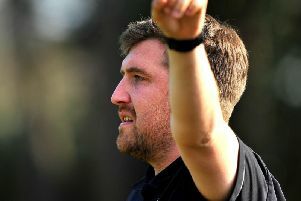 With extra-time looming, Dawes nipped in to apply the cruel finish and end Horsham’s final chance of cup glory and an Amex final. Horsham: Pelling, Metcalf, Merchant, Hyde, Sparks, Harding (Richardson-Brown 62), Shelley, Hayward (Hoare 67), Lavery, O’Toole (Taylor 74). Unused: Baxter, Smith.